Ruby Calling has two shows coming up! The first is a private function this Friday, January 10, 2014 in Seattle, WA. But fear not! 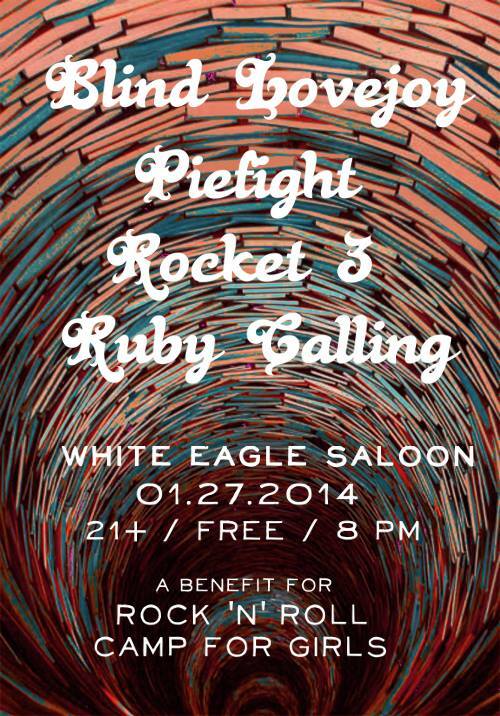 We are also playing a public show on January 27, 2014 in Portland, OR at the White Eagle Saloon. The show is a benefit for the Rock ‘n’ Roll Camp for Girls. We will be joined by our friends in Rocket 3, Piefight and Blind Lovejoy. The show is 21 + and starts at 8pm. Rumor has it we will go first. Ruby Calling will be playing a set at a benefit for the Rock and Roll Camp for Girls on 5/5/2013 at the Backspace in Portland, OR. We will be playing with two other local bands, Piefight! and Lather, Rinse, Repeat. It should be a fun show for a good cause. Show starts at 3pm. Backspace is located at 115 NW 5th Ave Portland, OR 97209. We plan to play at least one new song. Hope to see you there! Ruby Calling donated an MP3 for “The Patio” to friend-of-the-band, Colleen Wainwright. Colleen recently raised over $60,000 for a LA non-profit called WriteGirl which benefits teen girls. The MP3 was given to people who donated as a perk. It was included in the “communicatrix song pack” and the “Digital MONSTER Pack”. It will go out in a total of 507 packs which means we may get 507 new fans! For more information on Colleen’s campaign go here. Speaking of fans, our Facebook fan page has 98 fans. Who will be number 100? The band has been working up a new song. We have already begun sketch out the storyboard for the video and we hope Mike Northcott will collaborate with us again! We also invented a little dance to go with the song. You are going to love it! We still don’t have any shows booked right now. After a busy summer it was nice to take a break but we are ready to get back out there and play. Know of anywhere we should be playing? Let us know! Four concerts in two weeks! Ruby Calling is pleased to report that we played four concerts in two weeks. (Well, two weeks and two days but who is counting?) The first concert was part of a book tour for Joyce Raskin’s new book, My Misadventures as a Teenage Rock Star. Ruby Calling played a short set after Joyce read from her book and then Joyce’s band, Scarce, also played a short set. The best part was meeting the band and their family members and then hanging out with them at the Radio Room after the show. The second concert was our first true outdoor concert*. It was a private concert for a block party in NE Portland. We had played about half of our set list when we were switching places. I had just told the very attentive audience that sometimes we think our name should be “Portland Fire Drill” when, lo and behold, an actual firetruck drove up! The block party had participated in National Night Out and part of the benefits were to have a firetruck attend the event. The kids went wild and it was quite a long time before we picked up our instruments for the second half of our show. We loved playing outside and hope we get other opportunites while the weather is still nice. The third concert was another private concert. We played a lunch time show at the Rock and Roll Camp for Girls. There were about 80 girls attending the camp ages 8-18 plus all the volunteers and staff. The best parts of that day were when one of the campers said, “Great show!” and another group of girls got up and started dancing to one of our songs. The final concert was a benefit concert that we played at Mississippi Pizza. The concert was to raise money for a friend of the band, Mark, who broke his ankle earlier in the year. He didn’t have (and still doesn’t have) insurance because he is self-employed and was denied when he tried to get it. We played the concert with Lather, Rinse and Repeat who are another band of friends. The concert went off without a hitch. Ruby Calling decided to up the stakes by offering to play two covers if we raised $200 and $250 respectively. At the end of the night we had raised $320! Here’s to good friends and family and friends we haven’t met yet! We don’t have any concerts scheduled for the future but expect to be back at Mississippi Pizza in a few months. If you want us to play on your beautiful outdoor deck before summer ends, Erin might just make an exception to going out on a patio. * We did play outside once during the filming of a new, unreleased music video for The Patio but we weren’t even plugged in. We are excited about doing this show with our friends Lather, Rinse, Repeat. We are excited about this poster, designed by our Ladies Rock Camp friend Beth Schore. And we are really excited to help out our dear friend Mark Hoeveler, who broke his ankle this year while uninsured. We’ll be asking for donations at the door, and hope to see you there. Mississippi Pizza is really cool. Take note! Hungry Ghosts by Ok Go! Take Note! Crush by Piefight!